Since Zhou Yingxin is no longer a public figure, Taiwanese TV media has been pixelating her photos for privacy in the wake this incident. 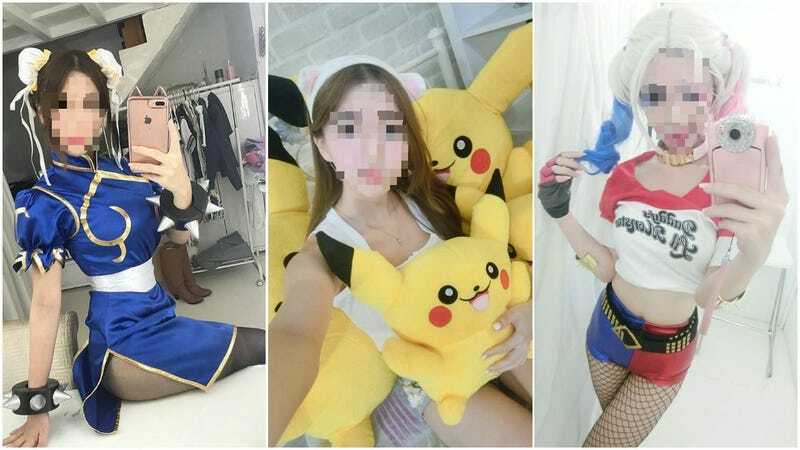 According to Taiwanese news reports, a 48-year-old Japanese man attempted to kill himself this weekend after an internet idol Zhou Yingxin announced her retirement. Thankfully, his attempt was unsuccessful. Note: If you are ever considering taking your own life, please know that there are people who will listen and can help. Taiwan News and the TV media report that on Saturday afternoon near Nankang Software Park, the man had stabbed himself in the stomach in what appears to be an attempted seppuku (ritual suicide). One passerby intervened, and according to Taiwan News, the wound was minor and not life-threatening. The man was taken to a nearby hospital for treatment. Warning: The linked clip in the screenshot credit below shows images of the incident. Internet celebrity Zhou Yingxin, aka Dora, was on hand at Nankang Software Park that day. With over one hundred Facebook followers, she often appeared at tech show and game promotional events as a booth companion or official cosplayer. This Saturday was her last public event, seeming to appear at a car-related show. According to Taiwan News, the man told authorities he attempted suicide because Dora was retiring and would no longer be uploading photos or making public appearances. He had traveled to Taiwan to see her last public event.